Holiday bliss can be yours. If the holiday season fills you with a mixture of anticipation and dread, you are not alone. The dizzying array of demands that we make of ourselves and that we believe are expected of us include hosting or attending various gatherings, gifting presents and imbibing too much rich food and drink. When you add a coming together of extended family – sometimes resulting in situations more uncomfortable than not – it can culminate into a perfect stress cocktail. Can we navigate this time of year with less stress? Yes. Here are some simple yet effective strategies to help you stay balanced during any trying time. 1. Insist on a daily yoga practice: even if it is just five minutes of breathing or pranayama. Breathwork is at the core of yoga’s powerful ability to quieten the body and soothe the nervous system. Your yoga practice begins as soon as you follow an inhale into an exhale and while we love the effect of physical yoga asanas in an hour and a half long class, even a five or ten minute morning practice can provide a gentler and kinder start to your day. If you have more time, take it but know that even five minutes makes a big difference. 2. Practice discernment: Ayurveda, Yoga’s sister science, notes that we are always “taking in food,” and the food is not simply the food we eat, it is all the external information and energy that we absorb. This becomes even more critical during this busy season, when we are surrounded by so much external stimuli. Our work to stay healthy, is to digest this “food” properly. We can only do this when we can limit our consumption, allowing our body-mind the time to absorb our experiences. How do we do this? By being more discerning about the things and the people we fill our days with and giving ourselves the permission to say no to what we know will not serve us. It’s okay to skip out on that party and enjoy a quiet night at home if you are spent. Give yourself the permission to relish stillness. 3. Practice Moderation: Have you ever wondered why the Holidays are all about excess and the New Year is all about detoxing from the excess? While we live in a culture of extremes, if we stick to healthful practices now our transition into the New Year will be much more enjoyable. One effective way is by cooking and eating simple foods at home to counter the rich foods we want to taste elsewhere. I’m not advocating deprivation, just moderation. Avoid refined sugar, and focus on cooking seasonal vegetables, whole grains, lentils and beans. Enjoy the holiday season. Go easy on yourself. 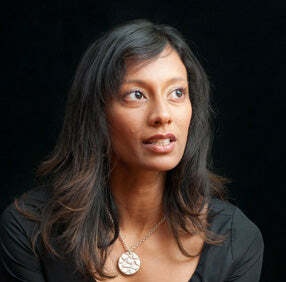 Writer, global yoga teacher, mama and Ayurvedic educator, Insiya is a wellspring of wisdom on living with more presence, grace, simplicity and bliss. Share in the honest and quirky insights of her journey on this worldly yet spiritual yoga life. You can find Insiya online at www.yogue.ca and facebook.com/yogue8.